When I told my friend Fred I was writing about the Pilgrims, he said he felt sorry for me because, really, what’s left to say? The shopworn attenuation of their story — the Mayflower, the funny hats, the bad winter, the caches of corn, Squanto — has been recycled every November, humdrum as crayoned hand turkeys. There is some guilt here, but we’re kind of tired of this bunch. I think the occluding problem is Thanksgiving itself. The real, gritty, striving Pilgrims can’t compete with all the burnished imagery, the bounteous food, the gathered family, the football, the parade. Historically speaking, we’re overstuffed. But then along comes a book like “Making Haste From Babylon: The Mayflower Pilgrims and Their World” (Vintage, 2010). Nick Bunker, a British financial journalist (and a Bunker of Bunker Hill), calls it “A New History,” and it’s full of surprises. No predictable Chapter 1, for instance, about our uneasy separatists in Holland in 1617, or the prayerful passengers coming ashore in Plymouth in 1620. Instead we find the Pilgrims in Maine, of all places. It’s 1628, and they’re desperate to make money. That’s because they’re in hock to the Adventurers, the investors who’d financed the Mayflower’s voyage eight years back. Unless the Pilgrims pay up, they can’t continue the settlement. They’d tried various schemes, like sending back salted cod, but Europeans could land their own fish. The continent didn’t have much beaver fur, though — which was abundant in America. By 1628, the price of pelts had shot up fourfold. That market became the ticket. Here’s the problem, though: Local tribes block the Pilgrims from trapping close by, since these skins have been promised to the Dutch. Only one far-away tribe offers an out. The Abenaki, on Maine’s Kennebec River, have been ruined by an epidemic and live at the northern edge of viable corn cultivation. Maine was teeming with beavers then, some 50 animals per square mile. The Abenaki are expert trappers, and the Pilgrims are serviceable farmers. A deal is struck: corn for fur. Within a few seasons, the Pilgrims retire their debt and build a trading post, the remnants of which are discovered in the 1980s, in downtown Augusta. “This was where the moment of maturity occurred,” writes Bunker. Once other Englishmen had proof the Pilgrims would prevail, the great migration of the 1630s launches. And our country begins in earnest. Do we eat Virginia hams every year, celebrating Jamestown? We do not. If Plymouth Colony had failed, there wouldn’t be Thanksgiving, and it would’ve failed if not for Native American help. This is both a source of pride and pain. “It is easy to mock past attempts to venerate and sanctify the Pilgrims,” writes Nathaniel Philbrick in his wonderful book, “Mayflower: A Story of Courage, Community and War” (Viking, 2006). “And yet we must look with something more than cynicism at a people who maintained more than half a century of peace with their Native neighbors.” Philbrick brings poignant context here; this book spawned off his research on the devastating King Philip’s War, which was waged by the Pilgrims’ children and the son of the Pilgrims’ remarkable partner, Massasoit. So many revelations on these pages. I didn’t know, for instance, that the Pilgrims had a patent to settle near the Hudson River, but shot north by mistake. 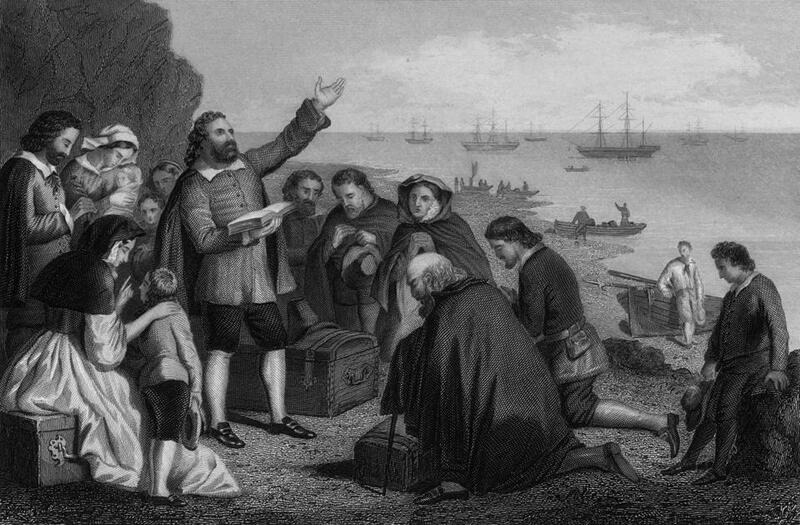 Because Plymouth lay outside any legal system, they conjured their own, writing the Mayflower Compact before they stepped on land. Moreover, I’d never heard that, while still in Europe, the Pilgrims showed “an extraordinary talent for getting duped.” Delaying Dutch officials, lying English provisioners, the list is long. I also didn’t realize that, tragically, one big reason the Pilgrims endured is because previous explorers had brought what may have been bubonic plague to the virgin soil; up to 90 percent of the coastal Indian tribes had died off right before the Mayflower sailed. That’s why the Pilgrims had access to abandoned villages and stores of corn. “Manitou and Providence: Indians, Europeans, and the Making of New England, 1500-1643” (Oxford University, 1982) sharply explores the consequences of this depopulation. Take Squanto, whose Thanksgiving reputation is all homey altruism. In reality, his generosity was calculated, and no wonder: Historian Neal Salisbury chronicles how he was enslaved by one of Captain John Smith’s lieutenants in 1614, then travels to Spain, England, and Newfoundland, only to arrive back in Massachusetts to find his whole Patuxet tribe wiped out. Decimated tribes could only survive by banding together. And so Squanto, taken in by the Wampanoags, and Samoset, an Abenaki, and Massasoit, a Pokanoket, debated whether to bring the Pilgrims into alliance too. They waited until March 1621 to make an overture; by then, half the Pilgrims had died over the winter and couldn’t refuse an offer. Without their ensuing Anglo-Indian support system, neither could’ve withstood the much stronger Narragansett who, living inland, had avoided the plague. Now for the outsider perspective: “Three Visitors to Early Plymouth” (Applewood, 1997), edited by Sidney V. James Jr., features letters from an Englishman (Emmanuel Altham), a Dutchman (Isaack de Rasieres), and a Virginian (John Pory), and the latter’s was only discovered in the 20th century. Today’s Plimoth Plantation was built partly from the specs in the Brit’s missive (he’s a stickler on everything from the height of gate posts to the number of goats). I especially liked his admiring take on Massasoit, bedecked in beads and black wolf skin who, out of respect for his puritanical host, discreetly brought only one of his five wives to Governor Bradford’s wedding. Unlike Fred, my friend Celia is positively jazzed about the Pilgrims. It’s personal to her; she’s one of 35 million Mayflower descendants — that’s 10 percent of the US population! Two lively reference books are gold for this rootsy cohort, since the authors wove portraits after combing through endless court records, wills, and documents (like the scintillating 1627 Division of Cattle). Caleb H. Johnson covers the first adapters in “The Mayflower and Her Passengers” (Xlibris, 2006). Robert Charles Anderson adds later batches in “The Pilgrim Migration: Immigrants to Plymouth Colony 1620-1633” (New England Historic Genealogical Society, 2004). Celia and I, with our giggling daughters reading aloud, got the goods on her ancestor, Edward Doty. Quite the firecracker, Edward; an illiterate bondservant who fought the first duel on American soil, he is cited dozens of times, once for failing to deliver six promised pigs, once for drawing “blood from the said Josias,” once for not fencing in his cows. But the man paid all his debts, bore nine children — and had the immense grit to brave a new world. These many generations later, Celia is an emblem of our American melting pot; she’s English, Irish, French Canadian, Swedish, German, Polish, and possibly Native American. “I’m bizarrely proud of being a Mayflower descendent,” she told me. “I’m proud Edward Doty came over as a bondservant. That he came from nothing, got into lots of scraps, but he made it.” Four centuries hence, the Pilgrims’ authentic story — in all its meaning, hardship, complexity, renewal — remains fresh. And for that, we give thanks.